I’ve had a desire to create a bracelet on the topic of time. A “functional” bracelet. Designed on a watchband, like a timepiece. But not quite. A statement piece and a note-to-self. But what's worth remembering? Often I bring my thoughts to Abraço, my favorite coffee shop, to test them around with my family-of-choice over first coffee. One morning, Barbara suggested meditation as a note-to-self and proposed Sit Stay Heal, a play on words used in dog training. The line came to her from one of her favorite teachers, Pema Chödrön. Sit Stay Heal suggests that training the mind is not unlike training a dog … I love this wry, Buddhist humor. A few years ago, I was working on a series of VideoClocks. My research on time and clocks opened a window into the philosophical and scientific debate about whether time actually exists; I became aware of the discord between standard time and psychological time; I learned that every living cell keeps time; that standard time and time zones were invented in the 19th century to coordinate train schedules; that the wristwatch brought us personal time; I learned that the experience of time is subjective, and as we age time speeds up and the years become liquid; I learned that past and future are fictions of the imagination and we exist in the present moment trying to manage a noisy and unruly mind. When your creations lead you somewhere excellent, it feels serendipitous. As if the universe showers you with gifts. The Sit Stay Heal bracelet led me to the Rubin Museum of Art. Delfina Roybal and I signed up for the weekly mindfulness meditation practice. In New York City, to sit and remain seated for the purpose of doing “nothing” is crazy wisdom. The teacher, Stacey Cochran, with a haunting, rusty voice, masterfully led us through sitting and staying: “Notice, as we begin to soften just a little and relax, that there’s a light inside, a light of awareness in the body and the mind that isn’t thinking,” she said sending us into ourselves. And as we drifted away in the sea of meandering thoughts, she would call us back, like a lighthouse, into the room. 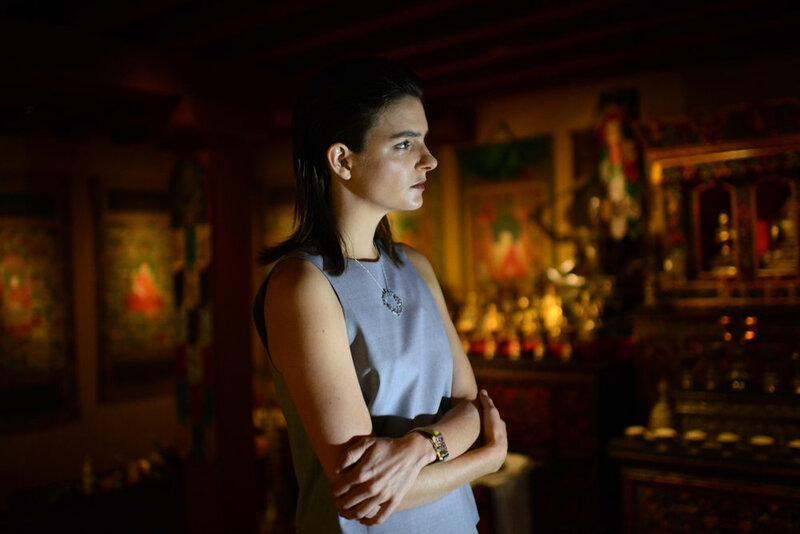 At The Rubin Museum, art and spirituality meet lucidly. Art draws us inward to observe both the chaos of mind and the organization of mind. Beyond the pop culture’s veil of Buddhism, I’m here to learn. The Buddhist world of symbols and storytelling is new to me. At The Second Buddha exhibition on the top floor I come across the concept of crazy wisdom--the outrageous, and unpredictable behavior of individuals who in enlightenment have transcended worldly delusions. I like that. It awakens the punk in me. Padmasambhava, known as the Second Buddha, is the Indian Tantric master who brought Buddhism to Tibet. A master of crazy wisdom and a master of time, he roams freely between past, present and future as he plants teachings, hidden treasures, so future people who need them can find them. I walk through the galleries to learn the stories of Padmasambhava in various states and scenes from his life. The most surprising piece in the exhibition is the back of the painting of the 16th century teacher and treasure revealer, Jatson Nyingpo. A message to a future reader is revealed on a touchscreen: Palms (of the artist?) pressed onto the cloth in red pigment. Several mantras are written below. Why is it so striking to me? The highly stylized paintings don’t reveal the artists. For someone like me, who sees through the act of making, the pressed palms of a person from the past is primal and powerful. I feel the hands and the weight of that body as it leans into the cloth. It’s late afternoon at Tompkins square park. The trees are dressed in the lush green of Summer. I’m listening to the podcast of the meditation session we attended and wonder what treasure awaits in the park. “As we settle, we begin to remember we’re alive…part of a larger life.” A dog rides a skateboard. His caretaker pulls him by the leash. Skate Stay Heal? As I return to listening, I feel a tug of grief for a moment lost to sweet distraction. Our existence unfolds between contradictions: Noise to silence, chaos to order, many to one. “As we prepare to close, noticing how it feels to open to a light of awareness inside, that’s also outside, that we share. And how it feels to be supported by life...together, here.” Stacy Cochran guides us to a shared moment. 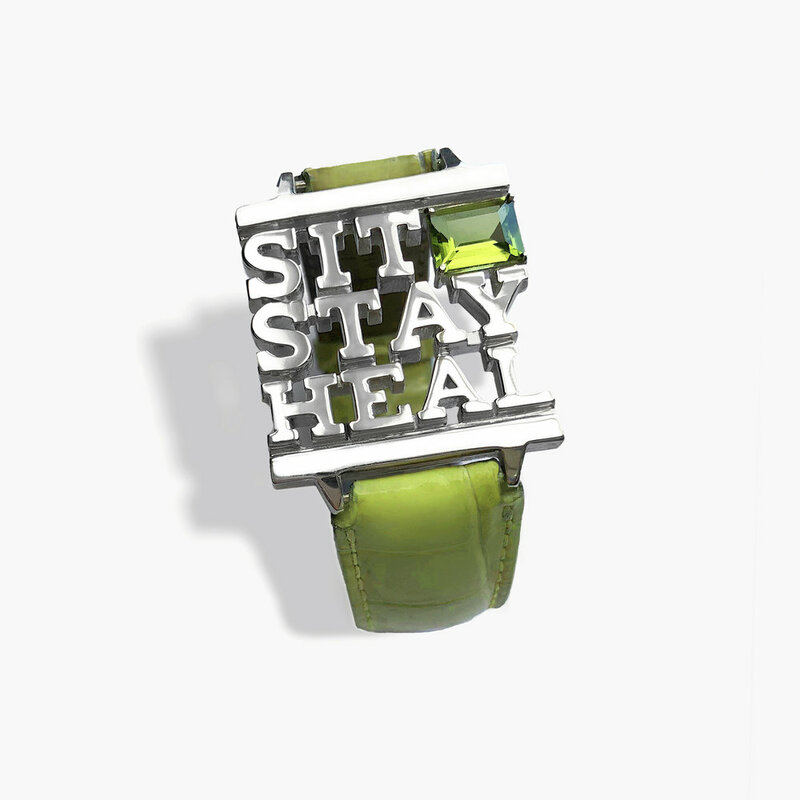 Sit Stay Heal Bracelet in Sterling silver, tourmaline, alligator skin watchband, stainless steel hardware. Unique.